On "CBS This Morning" on Monday, correspondent Anna Werner had the awkward task of reporting on allegations of sexual misconduct against her company's CEO. Werner spent several minutes early in the program detailing the accusations against Les Moonves. Six women told The New Yorker that he sexually harassed them. Werner noted that the CBS board of directors is expected to meet Monday and discuss the allegations. The meeting was scheduled before the New Yorker report was published. In her report, Werner also cited a report in The Wall Street Journal this weekend that said some board directors have discussed whether Moonves should step aside. "It's unclear whether that will come up today," Werner said. CBS News also covered the allegations on Friday night, after The New Yorker's story published, and over the weekend. 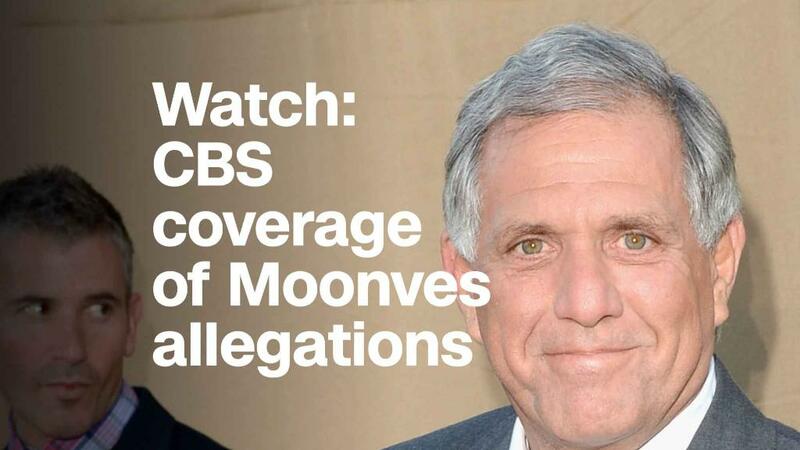 On the "CBS Evening News" on Friday, the report showed a clip of a Variety event last fall at which Moonves talked about how it's important for companies to educate and talk about sexual harassment. That report also included a CBS statement saying that The New Yorker's story would be included in the network's ongoing independent investigation into alleged misconduct that was launched last fall, after misconduct allegations against Charlie Rose of CBS News. "CBS This Morning" also covered the allegations against Moonves on its Saturday broadcast. One source told CNNMoney on Sunday that some board members spoke this weekend about whether Moonves should step aside during the probe. Sources also said that the directors plan to select a special committee that will oversee the investigation, which will be carried out by an outside law firm. In a statement to The New Yorker that was also obtained by CNNMoney, Moonves said he has "promoted a culture of respect and opportunity for all employees" throughout his tenure at CBS. "I recognize that there were times decades ago when I may have made some women uncomfortable by making advances," Moonves said. "Those were mistakes, and I regret them immensely. But I always understood and respected — and abided by the principle — that 'no' means 'no,' and I have never misused my position to harm or hinder anyone's career." CBS quoted from the same statement Monday. Werner also reported on allegations of misconduct against "60 Minutes" executive producer Jeff Fager. Six former employees told the magazine that Fager, "while inebriated at company parties, would touch employees in ways that made them uncomfortable." Fager has denied the allegations. The straightforward segment stood in contrast to the dramatic, personal way that "CBS This Morning" handled sexual misconduct allegations against Rose, a former co-host of the show who was suspended and eventually fired after The Washington Post reported on the claims last year. At the time, co-host Norah O'Donnell called the Rose allegations "a moment that demands a frank and honest assessment." "Charlie does not get a pass here," co-host Gayle King said. Rose has admitted some of his actions were "inappropriate," though he has denied other allegations. Werner's report on the allegations against Moonves quoted an executive from the National Women's Law Center who said that if the allegations are true, the network needs to send a stronger message. "I don't think you can send that message without some real consequences for those people who are found to have in fact engaged in this behavior in the past," Emily Martin, the center's general counsel and vice president for Education and Workplace Justice, said in the segment. Julie Chen, the wife of Moonves, appeared on today's edition of "The Talk," where she is a co-host. She declined to speak further about the sexual misconduct allegations against Moonves. "Some of you may be aware of what's going on in my life the past few days," she said at the top of the show. "I issued the one and only statement I will ever make on this topic on Twitter. And I will stand by that statement, today, tomorrow, forever." That statement, issued Friday, was: "I have known my husband, Leslie Moonves, since the late '90s, and I have been married to him for almost 14 years. Leslie is a good man and a loving father, devoted husband and inspiring corporate leader. He has always been a kind, decent and moral human being. I fully support my husband and stand behind him and his statement." The rest of the network's coverage on Monday will be followed closely. Stephen Colbert, the host of CBS' "The Late Show," has spoken out previously about sexual misconduct allegations involving Hollywood producer Harvey Weinstein and comedian Louis C.K.